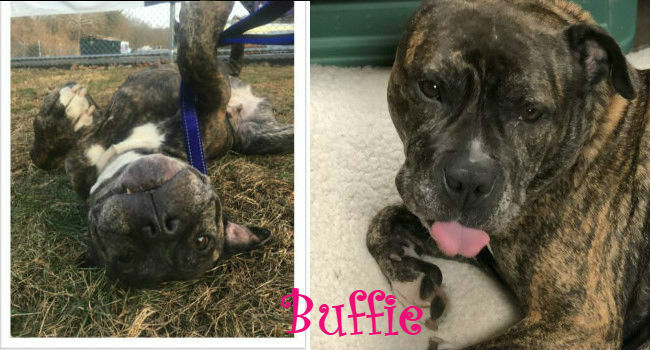 Buffie is approximately 8 years old, gentle, cuddly and loves other dogs! She came into rescue in need of major surgery. She had been living in pain, ears scarred shut from persistent, neglected infections. One had a hematoma. For sweet 8-year-old Buffie, love was an unknown concept. But the kind folks at the Ramapo-Bergen Animal Refuge, Inc. helped her learn. Buffie had to undergo intense medical procedures. Her right ear was too damaged to save and required amputation. She also needed bilateral ear ablation (doctors created new ear canals). Like so many of this rescue’s animals, Buffie is a survivor and a winner who overcame years of abuse. She is also forgiving and loves unconditionally. For Buffie to be living the life of a rescued dog today, and one who has won the hearts of so many people through her participation in Tournament of Tails (she became the champion! ), is incredible. Hers is the ultimate underdog story of survival and triumph against the odds. Buffy, who weighs 64 lbs., is sweet and gentle and good with other dogs. She loves going on walks with her friends here at the shelter. She also loves cuddling up in her bed! Please visit the shelter and consider opening your home and your heart to this wonderful girl! Visit the Ramapo-Bergen Animal Refuge website if you’re interested!